So i finished a couple small projects this week but was to lazy to post about them 🙂 Well okay not lazy i just chose to do different things. So i decided to share them with you over the weekend. First Up-another Market Bag. i really liked the first one i made and had bookmarked other patterns, cause a girl can’t have the same bag 🙂 A couple weeks ago i got some cotton yarn at my LYS just because i loved the colors and couldn’t say no. After putting the yarn up on Ravelry i checked to see what other people had made with the yarn. I always do this, it’s really interesting and gives you great ideas if you are one of those people that buys yarn with no plan. I saw the market bag and knew it would be just right. 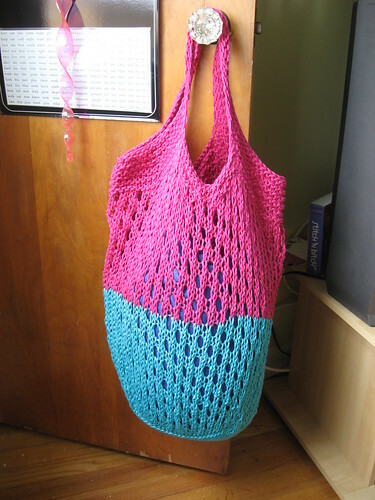 market bag, originally uploaded by Craftydiddl. My thoughts: I enjoyed the pattern. it’s very easy to memorize and a quick knit.. I noticed other ravelers made their handles thicker as well and when i got to mine i realized the extra rows were needed so i knit until i ran out of yarn-maybe 6 extra rows. It stretches out a lot. the fabric has a nice sturdy thickness and soft 🙂 Love it! You chose such nice Summer colours for your, well done!